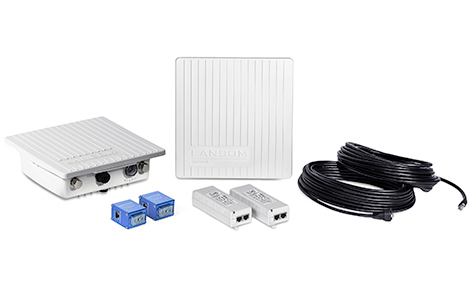 The Bridge Kit comes with all the components you need to quickly and efficiently set up high-performance point-to-point links between distant parts of buildings, for coverage of outdoor terraces, and for networking complex office architectures. Visitors or employees benefit from high-speed Wi-Fi “Made in Germany”. The two LANCOM OAP-821s supplied with the Bridge Kit each feature a WLAN radio module based on IEEE 802.11ac. They are ideal for establishing high-performance point-to-point links with up to 250 Mbps for linking extensive areas or for a secure connectivity of widely scattered buildings. Setting up a wireless network of this type needs no laborious cable installations or expensive leased lines. The LANCOM OAP-821 has a rugged IP66 protective housing, making it fully dust proof and water-jet resistant. It withstands temperatures between -33°C and +70°C to guarantee reliable operations even under extreme conditions. The LANCOM OAP-821 supports the WLAN optimization concept LANCOM Active Radio Control. This intelligent combination of innovative features included with the LCOS operating system - such as Adaptive Noise Immunity, Adaptive RF Optimization or Client Steering - sustainably increases WLAN performance and supports administrators with professional tools for WLAN management. With numerous integrated security features such as IEEE 802.1X, this outdoor access point provides optimal security for networks. Administrators and employees alike benefit from professional security policies on the network. The LANCOM OAP VPN option upgrades the device with VPN capabilities, which enables encrypted communications for remote management via IPSec VPN tunnel. In addition to that one can set a confidential WLAN to the headquarter via encrypted VPN tunnel. Quick and easy network integration of the outdoor access points as well as automatic assignment of the configuration - without manual configuration. For WLAN-controller or LANCOM Management Cloud-based installations, the access point receives the right configuration immediately after network authentication. The LANCOM OAP-821 supports the high-speed WLAN standard IEEE 802.11ac, so that you are well equipped for future challenges. What's more, LANCOM products are designed for a service life of several years and are equipped with hardware dimensioned for the future. Even reaching back to older product generations, updates to the LANCOM Operating System - LCOS - are available several times a year, free of charge and offering major features.